Ka Hoo, Mr. Q and Simon have different styles but it is interesting that they have many things alike. 1. All of them are male. 2. All of them wear glasses. 3. All of them are Canadian passport holders. Robertson, out of curiosity, how do you know the others two hold the Canadian passport? 亞狗, don’t bother about that, nobody cares! Mr. Q lived in Toronto for considerable time. Many of my friends know him very well. Simon returned to Hong Kong from Canada for good in December last year. Up to May this year, he is still looking for job. Robertson, thanks for your information. It is sad when I read the last sentence of your reply. Simon is young with much opportunity waiting for him to explore. Please send my concern to him. Don’t give up. He did a great job for the Canadian Chinese on the Head Tax issue. If HK no longer a good place for developing his career, not even a teaching position among the 8 universities is provided, may be he think about going to USA. In the long run, going to USA and be a scholar is much beneficial to him and the future China. HK is done. China is getting worse. What can you do? All said above is my opinion, up to his discretion, I hope everything is fine for him. I think you are a bit mixed up. 1. Ka Hoo is currently a lecturer in Hong Kong. I presume he is well-paid as he is getting fat judging from the previous photos in this blog. 2. The “Simon" I mentioned in my reply is the one on the left hand side of the top photo. Simon (the one on the left hand side of the top photo) joined Mr. Siu’s programme earlier than Ka Hoo. 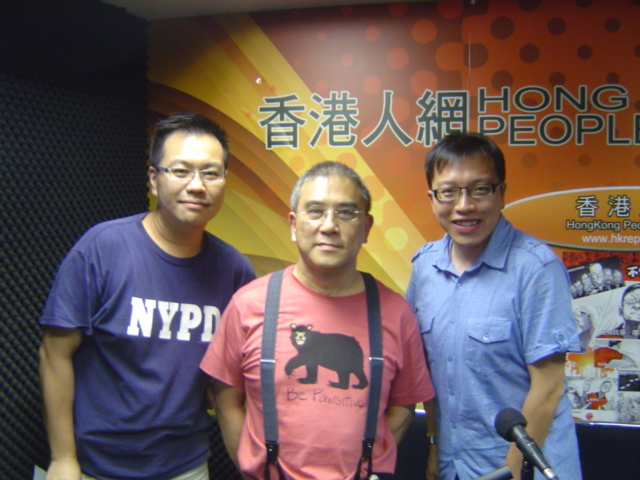 As a result, Mr. Siu and the other hosts of hkreporter call Ka Hoo as Ka Hoo and not Ka Hoo’s Christian name (Simon). Otherwise, there will be two Simon in the same show. Sorry to get you confused. Bible says, “The rich is hardly to heaven." Will that also imply to the “fat" one? Just a joke to amuse myself, no other meaning. It is nice to talk with you. Keep in touch. Mom says, “Thou shalt not 25″. By giving in to the demands of the greedy city unions who used piles of garbage as hostages in a good like manner to push thru their self centered agenda, David Miller has put the city deeper into the morass of financial desperation. If he had stood up to the unions, the problem would be on the road to solution. Now, it is becoming a disaster. Miller should do the honorable thing to resign to let somebody with more ability handle the job.